Lunar indication was one of the three elements of dial content, along with calendrical and astronomical indications in the period 1550–1770. The changing lunar phase, often with a lunar calendar index, was present on dials throughout the period, but its use changed. The pictorial representation of the changing lunar phase was both an aid to religious devotion and a representational tool in the context of nascent science. The lunar function was used for astrological and mnemonic purposes in the early-seventeenth century, but as astrology went into decline in the mid-late seventeenth century the indications changed. 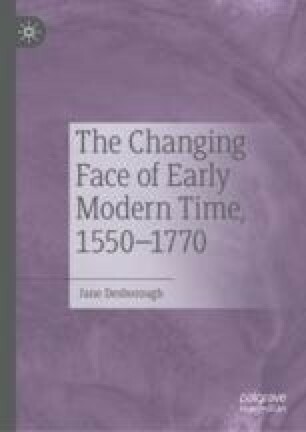 The use of information about the age of the Moon and the duration of moonlight was used for travel at night and tidal indications received renewed representation in the late-seventeenth century.